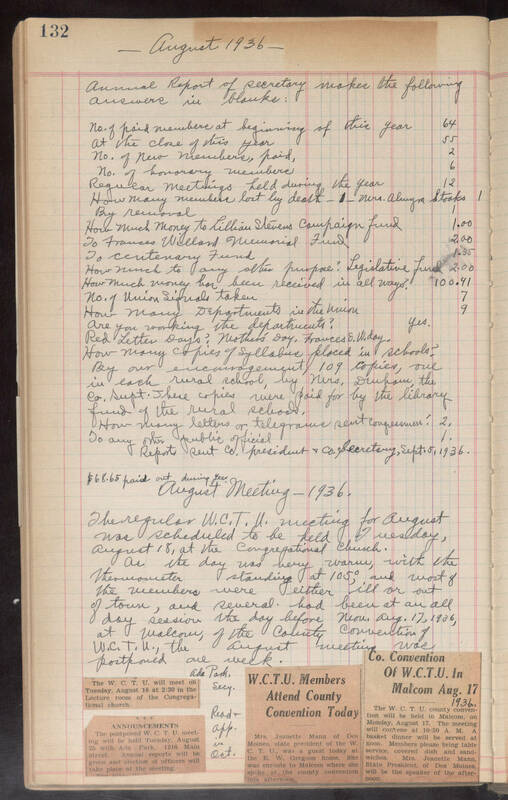 -August 1936- Annual Report of secretary makes the following answers in [blanks?] No. of paid members at beginning of the year 64 at the close of this year 55 No. of New members, paid, 2 No. of honorary members 6 Regular meetings held during the year 12 How many members lost by death _1_Mrs. [Alruyna?] Stokes 1 How much money to Lillian Stevens campaign fund 1.00 To Frances Willard Memorial Fund 2.00 To cemetary fund 1.35 How much to any other purpose? Legislative fund 2.00 How much money has been received in all ways? 100.41 No. of Union Signals taken 7 How many departments in the union 9 Are you working the departments? Yes. Red Letter Days? Mothers' Day, Frances E. W. day. How many copies of syllabus placed in schools? By our encouragement, 109 copies, are in each rural school, by Mrs. Druham, the Co. [Supt.] There copies were paid for by the library fund of the rural schools. How many letters or telegrams sent congremen? 2. To any other public official 1. Reports [Reut Co.] president & co. Secretary, Sept. 5, 1936. $68.65 paid out during year. August Meeting- 1936. The regular W.C.T.U. meeting for August was scheduled to be held Tuesday, August 18, at the Congregational Church. As the day was very warm, with the thermometer standing at 105, and most of the members were either ill or out of town, and several had been at an all day session the day before Mon. Aug. 17, 1936, at Malcom of the County Convention of W.C.T.U., the August meeting was postponed one week. Ada Park, Secy. Read and [app.?] in Oct. The W. C. T. U. will meet on Tuesday, August 18 at 2:30 in the Lecture room of the Congregational church. ANNOUNCEMENTS The postponed W. C. T. U. meeting will be held Tuesday, August 25 with Ada Park, 1216 Main street. Annual reports will be given and election of officers will take place at the meeting. W.C.T.U. Members Attend County Convention Today Mrs. Jeanette Mann of Des Moines, state president of the W.C.T.U., was a guest today at the E.W. Gregson home. She was enroute to Malcom where she spoke at the county convention this afternoon.